HinaChan (2 years ago) Inappropriate? Amanda Lynn (3 years ago) Inappropriate? Okay so, through trail and error, I came up with a solution to make it work in Daz Studio 4.5+. 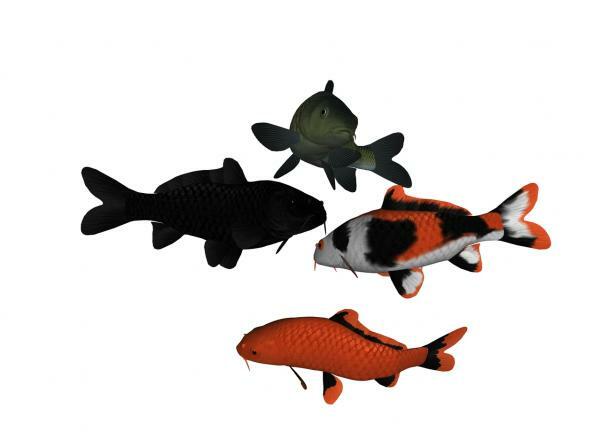 Import geometry file koi as poser obj, scale 10,000%. All mats work perfectly! DarkElegance (4 years ago) Inappropriate? when I dl it...there is no koi texture for it...are they some where else? The only work around I found was to save the Koi as a scene in DS3 or 4 and then it will work in newer versions of DS. Carrie58 (5 years ago) Inappropriate? eponica,all I can think to do is once you get it imported to DS4 save it .I am trying to figure out a way to save it and fix the import issue. Eponica (5 years ago) Inappropriate? First off: Thank you so much for the Koi! Second: I don't get it to work in DAZ 4.6. I can import the object fine, but when I try to load the cr2 file then there is no Koi. I may be daft, but could you (or anyone else) help me a little bit? Wonderful. Thanks to all of you for sharing your work. carp at Toucan Virtual Museum site,it was regrouped and rigged with permission from the creator of the mesh,and all of the textures were hand made by me.It has never been sold,Mr.Miyazawa wanted it to be free and so it is,I enjoyed makeing the textures for it and wanted to share them. Hope you enjoy. Missnancy (6 years ago) Inappropriate? it's very nice. I recall grouping and remapping this for koi textures back in 2007 when I found this (toucan's koi.3ds file) on turbosquid, but I can't find the folder. the trick was to group all the fins and to remap it so that both sides of the fish have separate texture co-ordinates. toucan was also selling the poseable koi file that is used in the promo images above. Thank you for the Koi! It is very much appreciated! Thank you for sharing these. Very much appreciated. I'm just the dispencer( does that sound wrong) the talent comes from Toru Miyazawa,the creator and Bill Brownson ,the modifier,thanks go to them for shareing their skilz. aztecmarco (9 years ago) Inappropriate? Thank you, the figure looks great!